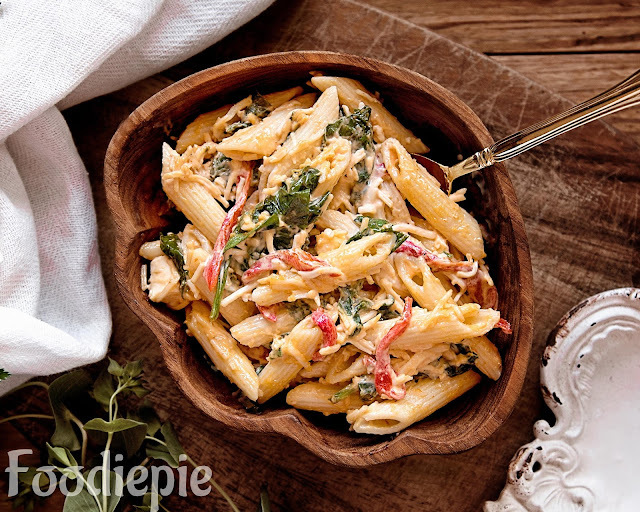 Pasta is an Italian dish, it is made by adding fresh fries in vegetables and white sauce. Capsicum, broccoli, black pepper and salt are used in making pasta.Pasta is a popular dish, which people of all ages eat with great interest. It can be eaten at any time in breakfast, lunch or brunch time. If you are hungry you can prepare pasta immediately and today we are going to share with you the recipes of white sauce pasta.This is quite simple to prepare at home with simple ans easy steps.Let's checkout recipe. Step 1 : Take 4/5 cups of water in deep sauce pan and let it boil over medium flame.When water begins boiling then add 3 cups of Raw pasta and add a spoon of salt. Step 2 : Cook pasta for 12/13 minutes over medium flame and check condition of pasta multiple times cooked or not.do not over cook.Take one pasta on spoon and bite it if it little firm to bite its cooked it is hard to bite its require more cooking. Step 3 : After boiling is done transfer all the pasta in colander and drain all the excess water. Step 4 : Heat a pan and add 1/2 teaspoon oil in a pan over high flame.Add all the veggies copped carrot,red capsicum,green capsicum, broccoli and salt as per taste. Step 5 : Cook all the vegetables for around 2/3 minutes until veggies cooked but still crunchy.Turn of the flame and transfer them to plate. Step 7 : Stir continuously and cook for a minute. Pour cup of milk and stirring continuously with whisk. Step 8 : Stir and mix for 2 minutes. Step 9 : Reduce heat of flame and to low. Continue stirring and cook until mixture turns into thicker. It will takes around 5 minutes or more. Step 11 : Add sauted veggies and pasta and mix well all in mixture.Turn of the flame. Finally : The tasty White Sauce Pasta is ready transfer it to a serving plate and serve it.